Small Town Takes On Big World! 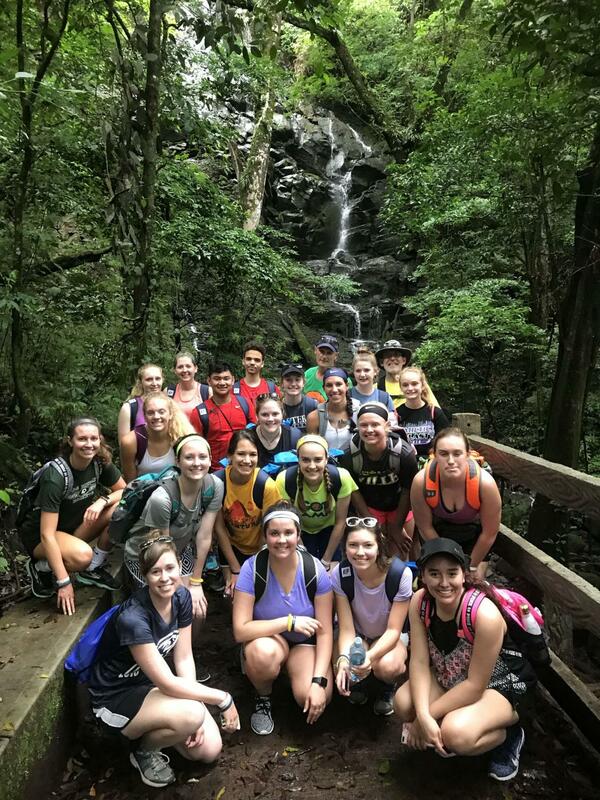 After hiking up to the waterfall at Rincon De La Vieja National park, the group poses for a picture in the middle of the rainforest. Howler monkeys, exotic plants, hikes to a volcano, hot springs, and lots of mosquitoes are everything a group of 18 students endured while traveling on a nine-day journey to Costa Rica. This is not the first time Mr. John Lum (Faculty) has traveled with students to Costa Rica; he took a trip there in 2015 and he liked it so much he wanted to go back. With sign-ups starting back in the fall of 2016, the students have been waiting two years for the chance to travel out of the country. On June 9 the students said goodbye to their parents for nine days as they gathered into a van that departed to catch their flight. “I was so excited up until that moment when I realized I’ve never been gone that long away from anyone before,” Madison Shupp (12) said. Leaving early in the morning from Dulles International Airport, with a seven-hour flight to Panama City, Panama, the travelers had a six-hour layover until they had to catch their connecting flight to Costa Rica. With time to kill, students came up with some creative ways to make it go faster. “I slept under the chairs in the airport, and then I went to look for food,” Shupp said. Once the six hours had passed, the group got onto the connecting flight and headed to Costa Rica. After about an hour flight, everyone went through customs and picked up their baggage. They were then picked up by the EF (Education First) tour bus and tour guide. Once loaded, they met up with the group from Kansas that they would also be traveling with. The group then headed to their first destination, Guanacaste. Starting off, the first day they traveled to Rincon De La Vieja National park to hike up the side of a volcano and see the numerous sulfur pools. The park is one of the many national parks in the Guanacaste conservation. Go Visit Costa Rica says it has over 34,000 acres of land, two volcanoes, and 32 rivers and streams. There the students and chaperones were taken on a hike by the tour guide where they saw all kinds of plants and animals. The next day was filled with activity that didn’t require hiking shoes but swimsuits; snorkeling. Even with the welts and stings, the group also got to pet a baby octopus that was found by one of the tour guides. Moving along, the next day the group went to La Fortuna in the province of Alajuela. There, pairs were decided for each boats to go kayaking on Lake Arenal. Half way through the trip, everyone was then given the chance to carefully get out of his or her kayak and jump in the cold water. With wet clothes still on, the whole group then loaded back on the bus and went to their next location. Taking about 15 minutes to walk down the steps to get to the waterfall, everyone was surprised to see gallons of water gush right in the middle of the jungle. Everyone was given the chance to swim in the strong current as it raced past the multiple rocks surrounding the falls. Whitewater rafting was next on the agenda for the next day. “I was so excited to go whitewater rafting until the instructor started talking about the bad experiences,” said Shupp. With only three people falling out of the raft, the whole group persevered through the fast rapids and high rocks. Halfway through, the rafts stopped for fresh pineapple and watermelon, which was then accompanied by cliff jumping into the river. After lunch, everyone was then taken ziplining which would allow you to be in the canopy of the jungle. With multiple shortstops, it was ended by a mile long ride across the river and back to where everyone started. Getting back on the bus, everyone then traveled to Tortuguero which could only be accessed by boat. “My favorite animal in Tortuguero was definitely the monkeys because I have never seen wild ones before,” said Clayton. Taking a boat to Tortuguero, multiple animals were seen sitting/resting along the river. The three types of monkeys (Howler, Spider, and Capuchin) were commonly seen in the trees and heard all throughout the day. The day was spent at the beach and exploring the city and taking in the culture. Taking the boat ride back, everyone then had to endure the rather long bus ride to the capital of Costa Rica San Jose. “It was very different from the rest of Costa Rica,” said Shupp. The capital is very much a city type atmosphere, very different from the jungle and dirt roads everyone was used to. With a population of about 400,000 people, commercial restaurants and stores that are around Mercersburg were seen. With the week coming to an end, everyone was ready for the flight out of San Jose back to Dulles International Airport. With the warm embraces from parents and siblings, students and chaperones returned back to the high school after nine days of packed schedules and physical activity. With lots of souvenirs and pictures to go around, everyone will have stories and memories that will last a lifetime.